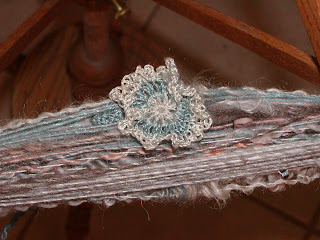 I decided to crochet flowers to go with this skein. They turned out really well and stand out, which is what I had hoped for. By making them myself, I was sure that they would match. It is hard to find novelty items in some color combinations. 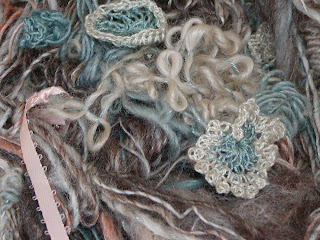 Another view of the yarn. On Ravlery, I see all these nice neat piles of yarn as stash. Well, I decided to post mine - I wouldn't dare to do it on Ravelry! 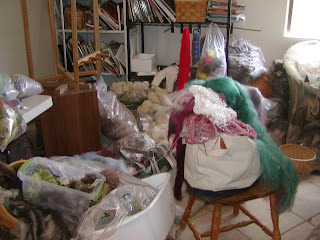 The stuff on the chair is going into the current yarn - a deep pink to wine colored yarn. Haven't settled on a name yet. 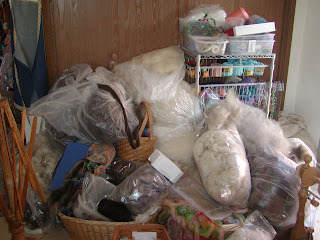 This is the pile that I was working from yesterday. 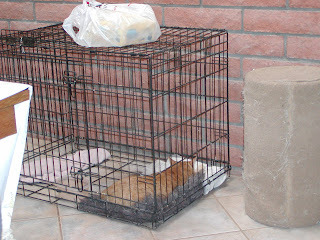 Kyle's black kitty was so small that he crawled right out the bottom of this cage. Kyle moved the cage to the kitchen and Garfield made himself right at home. The rug he is sleeping on was one of my felting mistakes.